Nagel Precision’s (Ann Arbor, MI) high volume honing systems have been the automotive industry’s gold standard for decades, with over 60% market share in North America for honing engine blocks, connecting rods and pinion gears. Nagel has now introduced a new of state of the art flexible stroke honing system ECO 40, developed specifically for low and medium volume production applications to hold submicron bore sizes and mirror finishes. 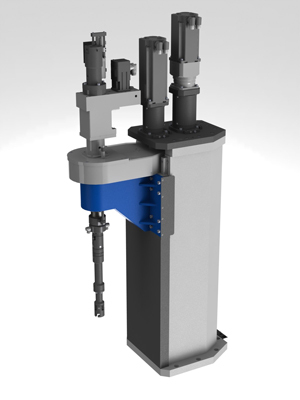 The system can have up to 3 honing and post process gauging stations and can finish bore sizes from 3 to 40 mm. 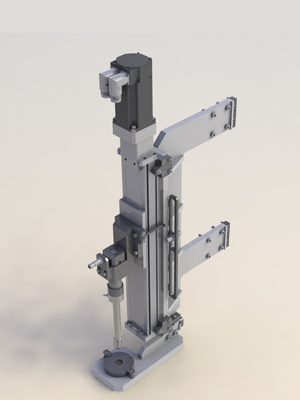 The honing spindle and the stroking system are driven by AB servo motors. Compact gear driven index table enables part loading unloading during the finishing operation. The system can either be fully automated or tended manually. 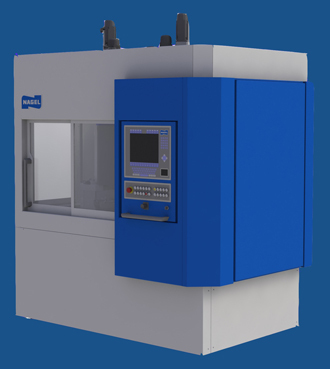 Also standard on the Nagel ECO 40 is an automatic tool wear compensation system integrated into the post process gauging system and the honing spindle. The system controlled by AB servo monitors bore size on each and every part and automatically compensates for tool wear in all the honing stations by making fine submicron level adjustments. This ensures great bore accuracy. This is a huge improvement over the manual compensation systems that are more prevalent in the market place for low and medium volume applications. In a manual compensation system, operator has to frequently measure the finished bore and manually compensate for the tool wear. Over / under compensation is common problem and leads to reduced control of bore size and also excessive machine down time as the operator has to stop the machine frequently to compensate for the tool wear. The Nagel ECO 40’s tool wear compensation system is designed to further minimize the non cutting time while improving the bore quality. Once the tool is inserted in the bore, the tool expands at a rapid feed of 200 um/sec and at high torque (45% of available) till it reaches a predetermined position close to the bore, it will then switch to a rapid stock removal mode of about 4 um / sec at lower torques (15% of available) to avoid tool damage, and towards the end of the cycle it will further reduce the expansion rate to about 2 um /sec at 10% of the available torque. The system constantly monitors both the tool feed (u/sec) and the applied torque (as % of available), if the desired feed is not reached at the preset torque, the operator can either reduce to tool expansion rate if tighter tolerances are desired or increase the torque if quicker cycle times are needed. This is an added key process control parameter provided to the operator. The tool expansion is rapid when there is no cutting and is slowest for the final finishing cut, which results in a consistent bore in terms of finish, size and cylindricity. In addition The Nagel ECO 40 automatically senses the form error (for example taper, hour glass, barrel shape, ovality, bend, etc.) and makes automatic adjustments to correct it. Most of the machines on the market today have a fixed stroke (as illustrated in figure 1) that is designed to hone a perfect bore, which as we are aware is not the case. However some machines do offer control to the operator to dwell for a longer time at the bottom of blind bore or program a different stroke length to correct form errors. This however would require operator to know the exact nature of inaccuracy coming in and generate a program to address that particular form error. The configuration will not be effective should the type of form error change. Hence it would require a skilled operator to inspect the incoming part and modify the stroking accordingly, which however not always feasible and could be time consuming. The Nagel ECO 40, equipped with post process gauging can sense the form error coming in on each and every part, and make automatic adjustments in stroke to more effectively correct it. ECO 40 raises the bore quality to all new different standard. Quality and productivity is not an accident, it is engineered in the system.